The Baby Lock Esante embroidery machine is an advanced sewing and embroidery machine. It features an easy-to-read touch LCD screen, where extensive editing may be done to embroidery designs. The Esante also has a built-in design library and has the ability to embroider at speeds up to 800 stitches per minute. Turn the machine on. The power button is located on the right side of the machine near the base. Wind the bobbin by placing the empty bobbin on the pin atop the machine. Place the bobbin thread on the spool pin. Guide the thread through the channel while following the dotted lines and the one through three numbers. Wrap the thread around the bobbin approximately three times and cut the thread at the base of the pin. Slide the bobbin pin to the right; this engages the winder. Press start. The bobbin will wind. Press stop when the bobbin has stopped spinning and is full of thread. There is also a tutorial on the machine in the LCD window on how to wind the bobbin. Unclip the latch on the bobbin case in the base of the machine and drop the bobbin into the casing. Guide the thread through the thread or channel and pull it toward you until the thread has been cut. Reattach the bobbin case cover. Raise the presser foot by pushing the "Presser Foot Lifter" button on the front of the machine. 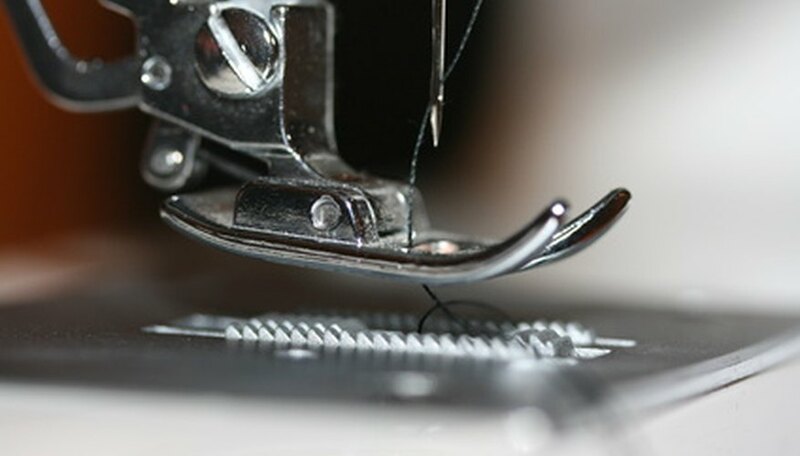 Place the embroidery thread on the spool pin on the top of the machine. Unwind the thread and guide through the channel following the numbers. Pass the thread through the bar in front of the needle (marked with a #6). Pull the thread around the side of the machine to the cutter. Press the lever on the side of the machine to lower the needle threader. Hoop the stabilizer and fabric in the embroidery hoop and clip it into the embroidery arm. Select the design that you would like to embroider. Make necessary edits to the design. Push the start button on the front of the machine. Many Baby Lock dealers offer classes on how to use the Esante machine. Call or check online for a class schedule.